Tadcaster Albion’s eight-match unbeaten run came to an end as former Brewer Danny Frost struck in the snow to earn Trafford a 1-0 victory. 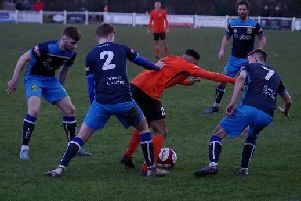 In a game that was largely dominated by the weather, it was Frost that prevailed as his second-half goal helped Trafford leapfrog Taddy into sixth place in the Evo-Stik North standings. The popular non-league marksman began the season with Albion before moving on pre-Christmas, and it was he who had the first chance of the contest. Tad’s giant stopper Michael Ingham is very rarely lobbed, but Frost tried his best and saw an effort slip through the Northern Irishman, only for Josh Barrett to clear the loose ball from out of the six-yard box. As the first of umpteen snow flurries across the course of the afternoon descended in Manchester, the home side then had an early goal chalked off for offside. Danny Frost’s curling shot was deflected off Barrett and turned in by Darius Palma, however the latter was adjudged to have burst through a fraction early. With the glorious yet freezing sunshine quickly reappearing, Taddy gained a foothold in the match and came close themselves on 13 minutes. Aiden Savory nodded a ball back across goal for former Leeds United man Billy Whitehouse to crash a header off the crossbar. Whitehouse and Casey Stewart continued to look menacing as ever with the ball at their feet inside the opposition penalty box, but they just couldn’t quite find that half a yard to properly test Grant Shenton in the Trafford goal. The two aforementioned wingers then combined to set up Savory, who audaciously back-flicked on target, but his effort wasn’t testing the Trafford keeper. With Albion were well on top, they carved out their best chance of the half 10 minutes from the break. Whitehouse’s forward pass into Savory was swept in behind first-time, releasing Chris Howarth into space down the right-hand side but his low drive was comfortably halted by Shenton. Howarth had another go seconds later, pulling the trigger from 27 yards out, however his beautifully-struck shot was well tipped wide by a fully-extended Shenton. Despite continuing to look dangerous in the final third after the interval, Taddy found themselves behind thirteen minutes into the second period. Keil O’Brien turned a corner just wide and Sean Miller also scuffed off target before old boy Frost did in fact break the deadlock. A hooked ball forward was misjudged by Barrett, allowing the nippy Frost to run clean through on goal and squeeze a shot underneath Ingham. The opening goal was almost immediately followed by a second but Andy Langford turned narrowly wide for the hosts. With 66 minutes on the clock, the worst snow storm of the afternoon arrived. The frantic flurry turned into a blizzard with the white stuff settling immediately on the pitch. And with the home side clad in a white kit and a white ball being used, it was difficult to see, let alone attempt to play football. After the referee allowed play to continue for three to four minutes, the decision was eventually made to take the players off with conditions worsening. The sun quickly returned, and following a five-minute delay, play resumed with Trafford sporting yellow shirts in a bid to stand out against the white back-drop. With the Brewers pushing bodies forward to try and get something from the game, the hosts began to look more dangerous on the counter and Barrett had to clear what seemed an inevitable goal off his own line after Miller rounded Ingham and rolled on target. Albion boss Michael Morton then rolled the dice by throwing Conor Sellars and Joe Pugh into the fray and deploying Whitehouse as an extremely attacking full-back. The contest became incredibly stretched in the final stages with Taddy giving it everything in an attempt to grab an equaliser. However, the closest they came was nine minutes from time as substitute Sellars jinked inside in the penalty box and saw his ferociously whipped effort deflect onto the roof of the net. With the Brewers exposed at the back, Trafford could and probably should have netted a second right at the death when substitute Aaron Burns was picked out, but he was denied from point-blank range by an outstanding save from Ingham. Nevertheless, the home team had already done enough to earn themselves the points and Albion were left to reflect upon a first league reverse since early January.